It is a must-see! When the day comes to an end, the sky ablaze and the sea is adorned with gold sequins. 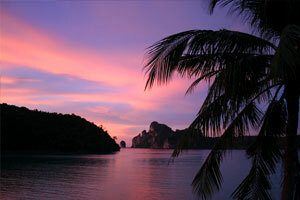 On Tonsai Bay, for example at the beach bar Phi Phi Rimlay, east of the pier to Long Beach. This fully open wooden hut is located at the water's edge, facing the bucolic long tails, the sun sets in front, behind the mountain. On Loh Dalam Bay: the aptly named Beach Bar is located directly on the beach. Its tables and chairs are planted on the sand, lit by small candles planted in the ground. The obvious place for lovers. Lastly, but more demanding, the best of the best is to reach the Viewpoint bar and enjoy around a soda (no liquor is sold up there), the orange and purple sky that illuminates Phi Phi bays. But beware of the descent of night. The more adventurous can also enjoy the sunrise but you'll have to get up very early!